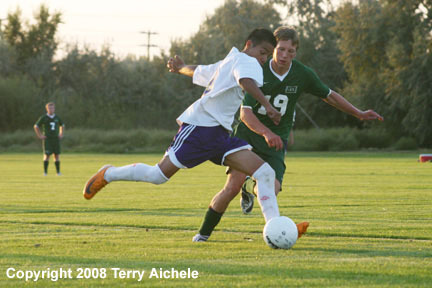 HERMISTON - A soccer match between the Hermiston Bulldogs and Oregon Episcopal Aardvarks became a race against a sunset deadline on Friday. A wildfire near Hood River closed I-84 for a time on Friday afternoon as the bus carrying the Aardvarks was on it's way to Hermiston. The game was able to start at about 5:52 pm and went until after sunset. The Aardvarks took the win 3-1. 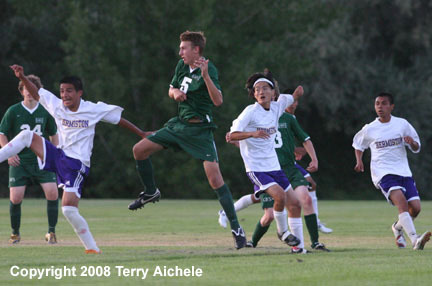 The Bulldogs controlled the ball early on keeping pressure on the Aardvark defenders and goalie. As time went on in the first half the play became more physical. 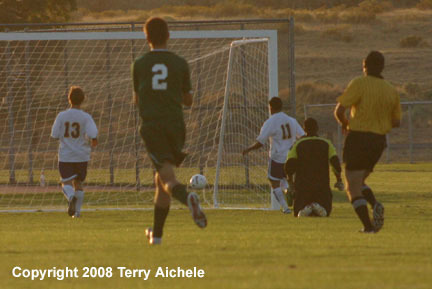 About 30 minutes into the match the Aardvarks scored on a penalty kick. With the sun dipping lower in the west the teams took to the pitch at about 6:45 pm to start the second half. Five minutes into the half the Aardvarks scored in what was quickly turning from daylight into gloaming taking a 2-0 lead. 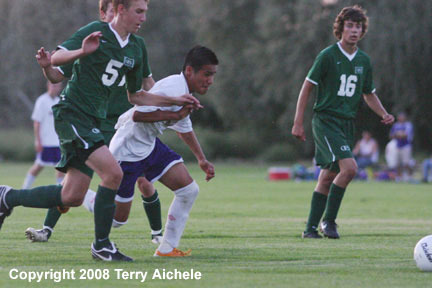 The Aardvarks continued to control the ball and put a lot of pressure on the Bulldog defenders. About 25 minutes into the second half the Aardvarks scored another goal to take the lead to 3-0. At the 30 minute mark Hermiston was able to put a play together to drive in for a score in what was becoming a very dark twilight. The goal cut the Aardvarks lead to 3-1. As the playing conditions deteriorated in the darkness so did the sportsmanship. There had been four yellow cards on the two teams up to about the 40th minute. At about that point a red card was given on an Aardvark and a few momments later a yellow on Hermiston. With the sun long gone the final whistle blew at about 7:30 pm. 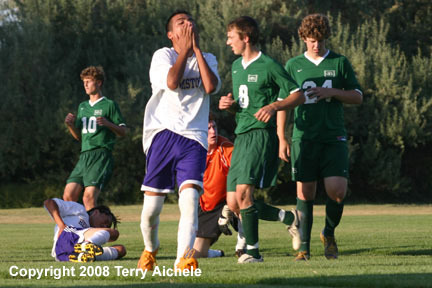 LEFT - A Hermiston Bulldog reacts after just missing a goal in the opening moments of the match. RIGHT - Hermiston drives into the Aardvark box early in the first half. LEFT - An Aardvark defender sends a Bulldog pass flying back down the field. 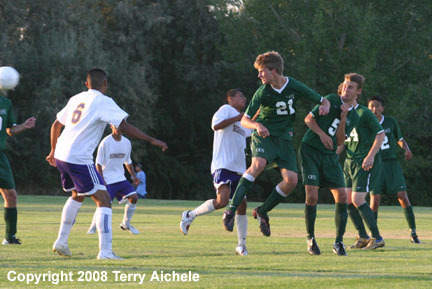 RIGHT - The Aardvarks score a goal early in the second half of the match to take a 2-0 lead. LEFT - A Bulldog drives along the side of the box. 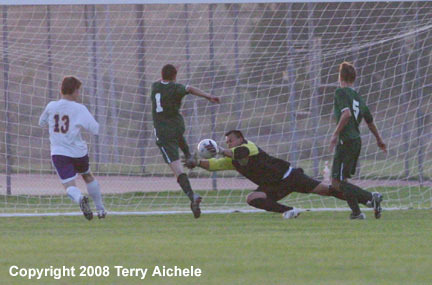 RIGHT - The Aardvarks score a goal at about the 30th minute of the second half to take a 3-0 lead. LEFT - Hermiston starts to put more pressure on the Aardvarks by setting up more plays. 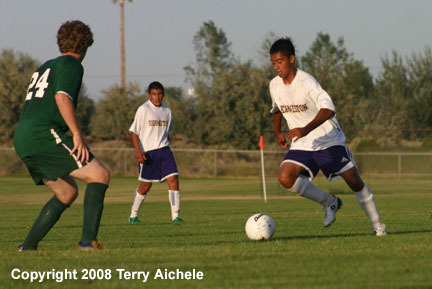 RIGHT - A Hermiston forward drives to the goal just moments before the Bulldogs score.